This is one of LROC’s first mosaics of the lunar South Pole, showing the region in all its glory. These mosaics are composed of several individual images taken by the wide-angle camera (WAC) on LRO that are stitched together. These big, beautiful images allow investigators to explore the geophysical and compositional properties of the lunar surface on a global or regional scale. 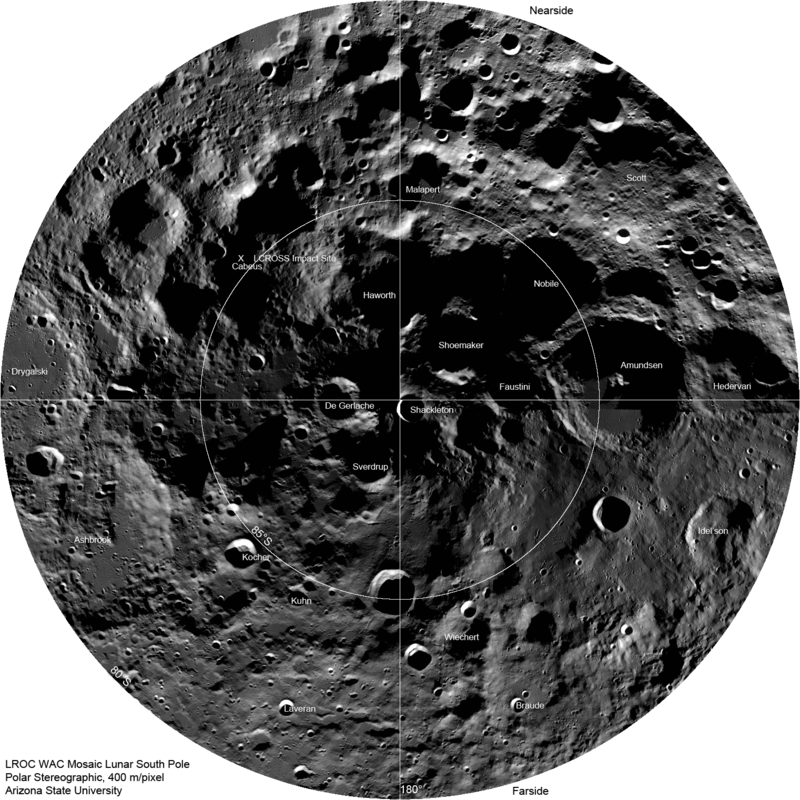 WAC South Pole mosaic showing locations of major craters. The impact site of the LCROSS spacecraft is marked with an 'X'. Credit: NASA/GSFC/Arizona State University. All the mosaics from the WAC and the two Narrow Angle Cameras (NAC) and WAC mosaics are produced using a specialized image-processing package called ISIS, the Integrated System for Imagers and Spectrometers. ISIS has the unique capability for processing data from several NASA spacecraft missions and when it applies, scientists can put everything together to get the big picture. As LRO passes over the pole every two hours, the LROC WAC snaps an image, and over a month, images covering the entire polar region are captured. This mosaic contains 288 images taken in one month; if you look closely, you can see where the month began and ended at about 90°E longitude and note how the lighting changed. This makes the rim of Shackleton crater appear to be slightly disjointed. This is caused by how the Sun came from opposite sides for portions of the mosaic, resulting in opposite sides of the crater’s wall being illuminated in some images. As the mission progresses, the WAC will capture the pole across the full range of seasons and we’ll see even more spectacular views of this region, as well as the entire Moon. Awesome. I love the way the sun is hitting the craters from 360 degrees, but it doesn’t look all choppy and tiled. It has a dreadful vortex kind of feeling though. Creepifying. Great image(s)! Telescopes at/in Shackleton? i LIKE! Can only hope I’m still around to see it! COME ON USA! Get off you derriere and lets get on with it! Clatonium – ditto! I see the ‘vortex’ too but suspect its only an image(s) artifact, due to lighting… as mentioned above? There is an Aitken Crater but no Aitken Basin. What you refer to is the South Pole – Aitken Basin, so named because it lies between the South Pole and Aitken Crater. Sadly, the largest impact basin known does not have its own name. I also do see a “swirl” but maybe it is my imagination.